We use a classical mechanism to constitute fermions from continuous waves, giving the quantum effects we expect, and a useful approach to the wave/particle duality. See Physicality Described for a more readable introduction. A fermion is a point event where bosons meet specific criteria. 2 bosons = 1 fermion event. Fig.1: A fermion event, and its deconstitution. Fig.2: Boson propagation. See also: equivalence. Fermions are point-like events, constituted from bosons that propagate as discrete vacuum energy. A boson comprises two bound waves in one axis, b.
Fermions are snapshots of boson states, where a condition of quantization is fulfilled by two bosons at a unique point. This is how we generate discrete events from continuous waves. Each fermion has a minimum of two bosons entering the event, and two bosons leaving the event, forming a matter network when such bosons are extended to other fermions. Each boson has an intrinsic mass-energy, which imposes a phase modulation on all other bosons where they overlap. This enables conditions for quantization, and consequently the position of collapse, which can be quantified in several types of action. All processes of matter are constitution-invariant, i.e. the same fundamental processes are at work, whether we're looking at a steady state, or a change of constitution. Our model allows accountable re-encoding of matter while conserving the foundational elements. A fermion is conserved when its constituents return to form another instance of the fermion. In fig.3, the fermion A has two bosons which collapse by interacting with vacuum bosons at events B and C, which respectively radiate as bosons, and collapse at D. So, the fermion re-constituted at D, from A, with spatial displacement d x . The points A–D are the fermionic states of Zitterbewegung, with the vacuum interactions contributing a 'pressure' for the constitution, as found in the Casimir effect. Mass-energy – Physical properties from the collapse function. Constitution – How a particle is conserved, and the exchange of bosons with vacuum. The three charge types are emergent properties of the mechanism, but they are not abstract; they have traceable origins in the collapse of waves, conservation of constitution, and exchange of waves with vacuum. Field and action effects are emergent from the basic mechanics. W and Z bosons are found within the paths of fig.3; electro-weak symmetry breaking is an instinsic part of any fermion's reconstitution process, and refers to a choice of which of a fermion's non-excluded waves is to collapse first. Magnetic currents emerge when vacuum waves interchange with fermion constituents. Gravitational interactions are emergent from wave collapse resulting from the coupling of the particles' own waves with those of the flux generated by 'classically organised' bodies. We are confident that this can be reconciled into a unified mechanism. Schematically, matter forms a connected network of fermions in space-time, the resolved bosons being simple connecting propagators. Bosons will only connect fermions that are on the same world lines. Rather than this being a coincidence, it is better to think of world lines as a requirement for coupling, with bosons always propagating at light speed. When we view this matter network from the perspective of a boson we find that the boson connects two fermions, and when viewed from the perspective of a fermion, we find that a fermion is formed from two bosons and emits two bosons; the two bosons pass continuously through the fermion event. Our interpretation of quantum mechanics is (pre)deterministic, Bohm-like (except we do not separate wavefunctions from instances; they are the same thing to us, dualled in ‘quanta’ oscillators that comprise the totality of the mass-energy). The observer has limited knowledge of the matter network, resulting in a picture of probabilities for future collapses, which are realised regardless of observers. A closed system is one where all bosons are connected to known fermions, and vice versa. A practical system is likely to be open, due to the nature of the vacuum. Persistent states are repeatedly re-constituted, and all fundamental bosons propagate at 'light speed'. Even classically stationary particles obey this rule; outgoing bosons form nearby fermions, and return as the same bosons. We regard the universe as a multitude of bosons, the fermions being the interaction events. Such a universe does not need a 'multiverse' to resolve quantum futures; quantum effects can be reconstructed without using contentious principles, and can be explained in terms of pairs of waves forming fermions. Quantum formulations, chemistry, and classical physics emerge naturally from the fundamental propositions. The classical velocity for one complete jump is d x / d t despite the constituent bosons propagating at light speed. More iterations may result in a respectively lower aggregated classical velocity, as vectors cancel out. Note that fig.3 simplifies spatial dimensionality, and the actual displacement would depend on propagation angles. The wavefunction depends on all non-excluded waves in A–B, A–C, B–D, C–D, and vacuum expectation values. 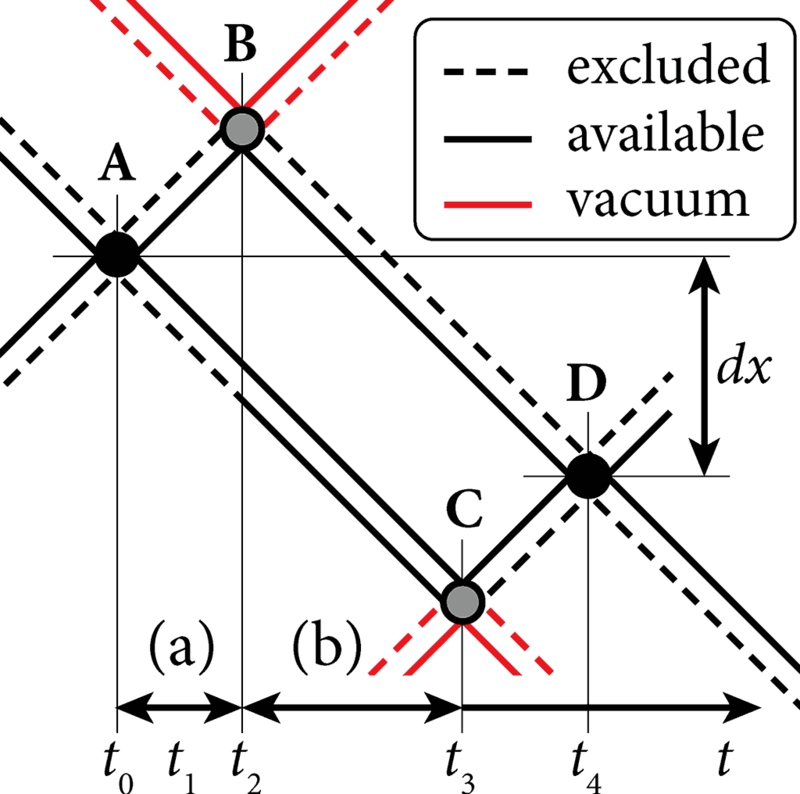 This is further partitioned by the symmetry breaking of either A–B or A–C (seemingly spontaneous, but it comes from instances of vacuum energy), and optionally from symmetry-breaking interactions (not shown in fig.3) of the unbroken bosons from B and C that are emitting into vacuum. The physical process, associated with the partitioning, collapses the interacting boson and switches on the newly-available wave, from the same source, that was previously excluded.